In the cycle of the daily readings, today we read once again the Gospel passage that we read on the Church New Year: St. Luke’s account of the Lord’s entering the synagogue at Nazareth and announcing His Messiahship by proclaiming the acceptable year of the Lord. 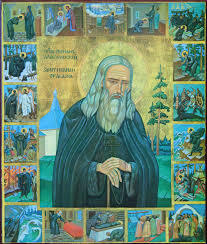 St. Theophan the Recluse points out that, unlike all the prophets before Him, the Lord Jesus Christ not only could preach about the acceptable year of the Lord, He could – and did – make it happen; He brought it with Him. These brief words of St. Theophan address a spiritual malaise most of us share: sluggish inactivity based on a dreamy desire for a phony paradise both without and within. The phony external paradise we dream of is an earthly life with no problems, in which everyone is just and kind to us. The phony internal paradise we dream of is a state of inner purity, calm, and happiness based simply on thinking and not on doing. The heresies associated with these delusions are, respectively, chiliasm and gnosticism, and the two work together and feed each other. The ever-present spirit of chiliasm distracts the pious from what they have control over – struggling for their salvation – by entertaining them endlessly with the demonically orchestrated struggles of financiers, politicians, parties, races, and nations for dominance. Today this is far truer – quantum leaps truer – than ever. I say “quantum leaps,” because global communications technology has given worldly powers the ability to distract and delude everyone 24 hours per day in such an addictive fashion, it is a wonder there is anyone left who can think straight. Facing this state of affairs realistically, we must beg God for the grace to re-double our efforts to pray and work in a disciplined fashion, simply to pay attention to that over which we have control, and deal with it. We must remember, always: this life is short, death is certain, and judgment is eternal. Seen in this light, promises of an earthly paradise will not entrap us in the cycle of excitement, failure, disappointment, and despair. When one despairs over the phony, chiliast earthly paradise, then one is tempted to retreat within selfishly, give up on the moral struggle, and desire a phony, gnostic internal paradise. Gnosticism is the idea that if you have a certain secret knowledge about “what’s really going on behind the scenes,” you are among the elect. A gnostic does not have to be moral or receive God’s forgiveness or even try to do anything good. He just has to sit around smugly and say to himself, “I know what’s really going on, unlike all those suckers out there.” And with this he is content. We are not going to join sects and secret societies that offer such a bogus salvation, but, as with the chiliast temptation, we all have the gnostic temptation: to try to think our way to salvation instead of seeking and doing God’s holy will. We can spend endless hours on websites to “find out what is really going on” and thereby feel secure through our “knowledge.” We can turn Orthodoxy into a kind of gnosticism in which, despite the manifest reality that we are enslaved to various passions, we read books on spiritual life and, instead of being brought to repentance, we imagine that we are thinking or feeling the thoughts and feelings of the saints, or in which we read the canons and derive satisfaction from knowing that so-and-so over there is breaking them, and since we are not (or think we are not), we are the good guys. All the while, we are wasting time, skipping prayers, fasting poorly, gossiping, not supporting our parish, neglecting our family, spending money on stupid things, and looking at some kind of screen x hours per day far in excess of what is necessary. Being “in the know” does not save. The Lord said that the truth will set us free, but this comes true only if, having learned the truth, we obey it. “If you love Me, keep My commandments (John 14:15).” St. James says that the demons believe – and tremble (James 2:19). Not falsehood only is demonic. Accurate knowledge without repentance, without humility, without morality, without the spiritual and corporal works of mercy, is also demonic.